Middle School (we called in Junior High)--a time of discovering a new, older self and learning new skills. I learned to sew with a sewing machine in 7th grade Home Ec but that's a story for another day. Today I want to talk baking! Before we started to sew, we spent the first part of the school year in Home Ec learning to cook and bake. In our first class we learned to use measuring cups--carefully measuring out breakfast cereal into bowls. I remember thinking "How crazy is this?? Who is ever going to measure their breakfast cereal?" Turns out the joke's on me! Now that I have to be more careful about my carbs I measure my cereal every day! By the end of the unit we'd progressed to the point that we were making pie! Pie!! In 7th grade!! I still have the recipe for the cherry pie we made in 1962, clipped from a printed handout and stored in my overstuffed recipe box! I have no idea what the source was, but it calls for Minute Tapioca so I'm guessing that company may have written the recipe. I found similar recipes when I Googled Minute Tapioca and Kraft, it's parent company, but none of those I found were exactly the same recipe. Here's my variation of the original recipe but with less sugar, no food coloring, and no added butter. 4 Cups of drained water packed sour cherries. (They used to come in cans or frozen but these days I find them in jars). 1 1/4 Cup of sugar. ( I use 1 Cup of white sugar and 1/4 Cup of Turbinado Sugar). Drain all the water off the cherries--you'll have pie soup if you don't! Mix the cherries with all the ingredients in a large bowl. Line pie pan with one of the crusts. I use cookie cutters to cut shapes to use in place of a lattice for the top crust. Cut out the shapes or cut strips to make a woven pastry lattice. 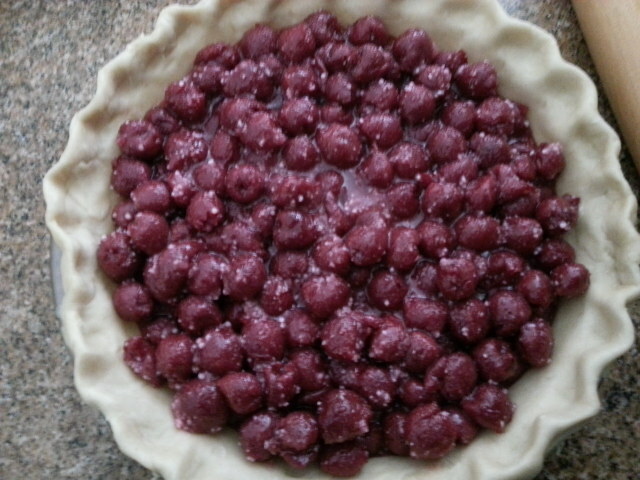 Pour cherry mixture into the pie shell. Cover the top with cut out pastry or a pastry lattice. Bake for 30 minutes at 400 degrees F. (Put a half sheet pan under the pie pan to catch any filling that bubbles out of the pie pan). After 30 minutes put a collar of aluminum foil around the outer edge of the crust so it doesn't get too brown. Bake another 20-25 minutes, until the pie filling is bubbling and the crust is a golden brown. Enjoy with vanilla ice cream and some good friends! Yeah for 7th grade Home Ec! I think it was school time very well spent!! I mean, unless you are a rocket scientist, when was the last time you used any calculus?